A Bengal eagle owl which escaped from the Cornish Birds of Prey Centre at Winnards Perch in the storms is now back safe and sound. Officers say there is now a full 999 and a limited 101 service. They're urging people to help them by only using the phones in a genuine emergency. The RSPCA is urging the public to report glue trap sellers, which are not illegal, but inhumane according to the animal charity. Dorset Wildlife Trust’s webcam has recorded a large number of barn owl chicks ready to fledge from the nest box located at the Lorton Meadows nature reserve in Weymouth. The webcam, which can be watched here, has been entertaining viewers all over the UK since April, when eight eggs were laid; a surprisingly large clutch for barn owls. Viewers have been monitoring the progress of the chicks since, with five owlets now getting ready to leave the barn owl box. Five owlets fledging is a great success story for barn owls, as their numbers have been in decline nationally, with 2013 seeing the worst breeding season in 30 years. 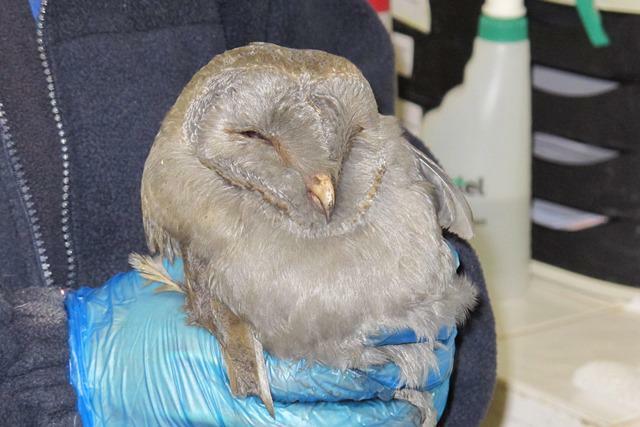 The RSPCA is urging people to stop using glue traps, as the second tawny owl in a week is caught by one. The RSPCA is urging people not to put down glue traps to capture rats and mice after a Tawny Owl was found attached to one near Bristol. Secret World Animal Rescue based at East Huntspill in Somerset have taken in a barn owl that was rescued from a chimney. It is clearly in good hands but we hope this doesn't happen very often. The Barn Owl Trust has started a national campaign to control rat poisons, which are killing birds leading to a serious decline in their numbers. The owls are eating mice and voles which have been contaminated, which in turn leads to a slow and painful death for the birds too. They make an unlikely pairing but staff at the Screech Owl Sanctuary in Newquay have found that one of their young charges is fascinated by their kitchen mop. Lightning, a Eastern Siberian Eagle Owl, is only three months old so still has its baby feathers. It does make it look somewhat mop-like. Every time workers get the mop out, Lightning hops out of its cage and follows it around - clearly more a hindrance than a help to the cleaning process. Here's a chance to see the "best friends" in action.